The original Smartire TPMS system used in Astons from 2005 to 2010 has some small flaws. When the battery in a wheel sensor dies you have to get the sensor replaced (there is no cloning to a cheaper sensor possible) and programmed to the car which makes your valet a fair bit thinner. So I decided to develop a complete replacement system. Go to the Solution tab to find out what is in pipeline. 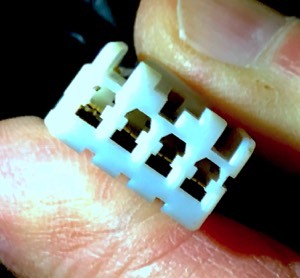 This is the connector of the SmarTire TPMS. If you know the name and type of this plug please let me know. I searched for a small TPMS system with display and found a suitable one. 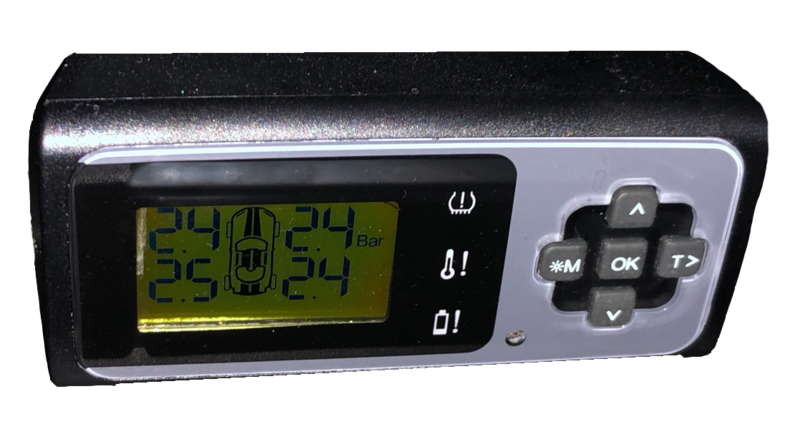 I built a power supply for 12V and a small electronics to connect the alarm signal to the Aston Martin electronics so the correct alarm light and message will be displayed in the dash if there is a problem with a tire. All this fits nicely in the battery compartment of the unit. It mounts in place of the existing system and needs no additional wiring. The system has a pressure display for all four tires. Wheel sensors can be cloned which provides the possibility to have a second set installed to the winter wheels and swap tires without the need for any reprogramming of the electronics. Currently I am trying to find the correct connector in order to make this replacement system Plug&Play. I have already installed this system (image below) in my Jaguar to test it over the cold months. When Vicky comes out of hibernation (see my hibernation timer) she gets it installed for a final test. As this system is still in development stage it is not available yet. You are welcome to subscribe to my newsletter to get immediately informed when this system is ready to be purchased.